When visiting Mom last week, as I was lying on my bed, she came in to lie down next to me and chat. This is a ritual we do, and I love it. We lie on the bed, talking about life, memories, upcoming plans, and sometimes hard topics. We talk about her mother, and her relationship with her. We talk about family. We talk about what's on our minds. And sometimes, we can't talk. There's a space between us, an argument gone too far with a dead brother, a reminder of the short time we have, the distance that fluxes. During one of these times, Mom pulled a book from the bed's headboard bookcase (one must truly love a bed that has a bookcase as a headboard, I know I do), and handed it to me. "This is a good read," she said. I said thanks, and added it to my small pile that I was attempting to read during my week visit. It was this book. I didn't finish my previous books until today, so this one came up. The book is a Newbery Honor winner, unsure if that's the "winner" or the "finalists list" but, hey, has Newbery associated with it. which makes it a finalist, but not a winner. The book is about acceptance: accepting losses, accepting people for who they are, accepting loneliness, accepting mistakes, accepting. I struggled a bit with the speech patterns in the book, imagining different races to the characters than what was described, based on the media portrayal of language patterns, and fought the whole book to keep the correct image in my mind of the characters' described race. I did give up and imagine the characters as I saw them, and that made for a better reading for me, even if it wasn't as the author imagined. It is, as Mom said, a good read. It's short. I recommend reading it with a small person, and getting her take on it. If you don't have a child, niece, nephew, or the like, cuddle up with your five year old self and read to her. “He just doesn’t want to be left alone,” I told the preacher. “That’s all. 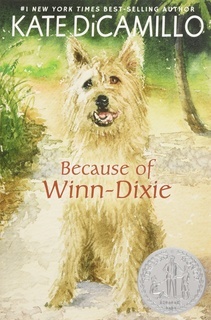 Let’s take him with us.” I could understand the way Winn-Dixie felt. Getting left behind probably made his heart feel empty. I finally decided that I was more afraid of losing Winn-Dixie than I was of having to deal with a dog-eating witch, so I went through the gate and into the yard. Except all dogs like peanut butter. She told me she used to love to read stories, but she couldn’t anymore because her eyes were so bad. “Can’t you get some really strong glasses?” I asked her. When I grow old and can no longer read, I want someone to read to and for me. “To keep the ghosts away,” Gloria said. I looked at all the bottles on the tree. “You did that many things wrong?” I asked her. “But you’re the nicest person I know,” I told her. “Don’t mean I haven’t done bad things,” she said. “What’s that?” I asked her. “It’s different for everyone,” she said. “You find out on your own. But in the meantime, you got to remember, you can’t always judge people by the things they done. You got to judge them by what they are doing now." And this was when, while reading the book, I realized why my mom had given me this book to read. “Slavery, yes,” said Miss Franny. “It was also about states’ rights and money." It was about money, yes. It was about money because the slave-owners of the south didn't want to lose the cheap labor they had, so that they could keep their money. States' rights became a sanitized cause, but wasn't really the point. “Men and boys always want to fight. They are always looking for a reason to go to war. It is the saddest thing. They have this abiding notion that war is fun. And no history lesson will convince them differently." "He went off to be a hero. But he soon found out the truth.” Miss Franny closed her eyes and shook her head. “What truth?” I asked her. “There’s a secret ingredient in there,” Miss Franny said. “I taste it,” I said. Sometimes, it seemed like everybody in the world was lonely. I thought about my mama. Thinking about her was the same as the hole you keep on feeling with your tongue after you lose a tooth. Time after time, my mind kept going to that empty spot, the spot where I felt like she should be.